Rhone Wine Holidays—We will be tasting 2017's soon on our tours - here is the Jancis Robinson verdict on the vintage...promising! We will be tasting 2017's soon on our tours - here is the Jancis Robinson verdict on the vintage...promising! It was all the right weather, but not necessarily in the right order, to misquote English comedian the late Eric Morecambe. One year on, the end results of the 2017 vintage in the southern Rhône are clearly of the highest potential quality, but in significantly restricted volume. The word potential is important, because while the weather produced grapes that were undoubtedly capable of creating fantastic wine, it was equally possible to spoil this potential, most often through over-extraction or overripeness, and possibly both. It could be convincingly argued that this is a scourge of many a wine region these days, although the warm climate and naturally powerful varieties of the southern Rhône exacerbate the problem – as did the weather patterns of 2017. The season started out mild, which accelerated growth and resulted in early and enthusiastic flowering. Then, however, came a period of cooler, wetter weather which meant the vines suffered from high levels of coulure, which is when incomplete fertilisation results in reduced fruit set. At this point, it was all but inevitable that the 2017 yield would be low, made worse by a warm, dry summer with less than half the usual rainfall. The grapes were therefore smaller than usual, and ripened quickly because the crop load was low and temperatures were high. Consequently, the harvest started in late August – much earlier than normal. Fine, dry weather meant that the fruit was in excellent sanitary condition, and that little or no selection was necessary. However, it became clear that the desired levels of sugar and acidity did not necessarily mean sufficient ripeness of flavour. There are no green, underripe notes in these wines, but there are many examples of nondescript fruit with bitterness on the finish. Furthermore, the naturally high proportion of skin to juice can result in an exaggerated, unbalanced structure, where acid is too low (especially in whites) and alcohol is too high. The bravest growers let their grapes stay on the vine to maximise flavour development, and the best winemakers were careful to handle the fermentations gently. In these instances, the finished wines fulfil the excellent potential of the vintage. In terms of volumes, every appellation recorded lower yields than in 2016. Vacqueyras had an average of 27 hectolitres per hectare, compared with their usual 36. Vincent Avril at Clos des Papes made only 40% of his usual volume, and most of his neighbours in Châteauneuf-du-Pape (whose stony terroir is pictured below) faced similar shortages. 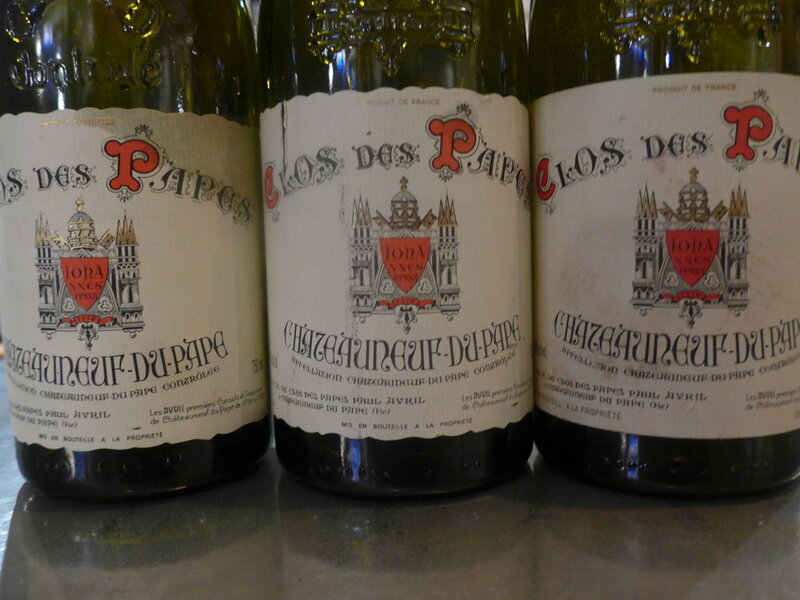 A curiosity of the Châteauneuf-du-Pape tasting notes is that there are more Cuvées Spéciales than Traditions (102 of the former, 74 of the latter). The smaller number of the traditional bottlings doesn't logically reflect the smaller vintage because the same number of these wines are made each year, just in varying volumes, whereas the fashion for Cuvées Spéciales is likely a reflection of producers making more ambitious and therefore expensive blends. It seems to be an important way for producers to differentiate themeselves from the competition. At their worst they are like concept cars – attention-grabbing, but at the cost of their fundamental utility: drinkability and enjoyment. At their best, they are genuine reflections of an interesting variety or terroir, although you could argue that even the best examples sacrifice classic Châteauneuf typicality in this pursuit. The general characteristics of the best 2017 southern Rhône reds are full body, concentrated fruit, mellow tannins and low acid. This makes them attractive to drink young, but with the intensity and structure that should age well. The whites are similarly full and ripe, but acid seems more obviously lacking, resulting in high viscosity and low refreshment. It is certainly a year that has produced some exciting and delicious wines, and is definitely worth buying, although I would not say it is definitively 'better' than the very good 2016 vintage. As ever, the producer's capability and the drinker's personal preference are as important as the weather conditions of the growing season. However, an additional factor worth considering is that the 2018 vintage is likely to be even smaller than the 2017, so devotees of the southern Rhône may want to buy while they can, especially from the most sought-after estates. Here are 17 wines that are some of my most favourite 2017s from the southern Rhône, providing plenty of buying options across all prices and styles. Ch de Beaucastel, Châteauneuf-du-Pape – I gave this the same score as their (much more expensive) Vieilles Vignes Roussanne. Nuff said! Chene Bleu Rosé a reference wine? It's Découvertes time again at the Palais du Papes!